I am so honored to be nominated for the Sunshine Blogger Award by Brandy at Brandy’s Happy Home! Thank you so much Brandy! If you don’t already know Brandy and her blog, be sure to go check it out. She makes absolutely incredible doll sized crafts, beautiful adult crafts and she even shares yummy recipes! 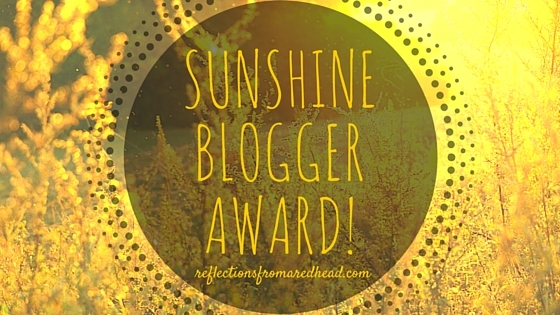 The Sunshine Blogger Award is an award given by bloggers to other bloggers they find creative, talented, and entertaining. Nominees answer 11 questions and then they nominate three bloggers and provide them with 11 questions to answer. All nominees must publish the rules for the award in their post and notify the people they are nominating via social media. I wanted to be able to share tutorials and bonus material with the people that buy my patterns. Sometimes I create things that don’t necessarily work as a stand alone pattern but are nice additions to a pattern I have published. I also love to share creative techniques as I have learned so much from others posting about how they did things. It’s hard to choose but I think my favourite post was “The Making of a Steampunk Jetpack and Flight Suit”. It’s my favourite for two reasons. One, I had been wanting to make a jetpack and flight suit for quite a while and I was really happy with how it turned out and two, I love showing people how I make things. The jetpack was made mainly of things from the dollar store that I transformed with paint. What is your favorite crafting tool? Hmmmm that’s a toughie. I obviously use my sewing machine A LOT. Apart from that, I use my awl an awful lot as well as my Crop-O-Dile punch/eyelet setter. What, if any, are your future blogging goals? I really want to increase the number of blog posts that I do and get into doing some videos. I have one video that is mostly shot and just needs a little more work…but it always seems to get pushed to the back of the queue. What is your biggest lesson learned since blogging? Blogging is a great way to draw people in. If you provide interesting content, they will likely check out the rest of your website. What is your best tip you could give someone interested in starting a blog? I tend to like blogs that are conversational, where the blogger writes as though they are talking directly to you. It seems more natural and organic that way. And I think that’s reassuring for someone who is hesitant to start a blog because they are worried about writing. Just write to your readers like you would talk to a friend or collleague. What has been your biggest obstacle since starting your blog? Updating regularly. Blogging always seems to take a back seat to other projects. Have you ever experienced a creative block, and if so, how did you overcome it? I haven’t had a creative block in quite a while…I usually have too many ideas to actually implement. But I think browsing Pinterest is a great way to get the creative juices flowing and find inspiration. What other activities do you enjoy when you’re not blogging? What is your favorite book, movie, or TV show? Ooooo this is a real toughie. Ok for book, I think I have to say Imajica by Clive Barker. Movie…I have so many. Maybe Big Fish? And TV show, probably Doctor Who. Tell us 3 things about yourself we might not know? Before making doll patterns, I worked as a consultant and technical analyst for an employee benefits consulting firm. I have a Jouralism diploma and used to work as a reporter/photographer for several weekly newspapers in the province. I am a Girl Guide leader. How did you get into appreciating and/or creating dolls? How many dolls do you own/have you created? What is your favourite thing about dolls? Besides dolls, what are your other passions? What is your favorite topic to write/blog/post/photograph about? What is a creative project you’d love to tackle? Tell us three things that we might not know about you. Thank the person who nominated you for the Sunshine Award and link back to their blog. Nominate 3 other blogs and give them 11 questions to answer. List the “rules” and display a Sunshine Award logo in your post.